The Futurescape Forum closed GIA’s sixth International Gemological Symposium with lively discussion. From left to right: David Ager, managing director of executive development, Harvard Business School; Kent Wong, managing director, Chow Tai Fook; Rahul Kadakia, international head of jewelry, Christie’s; Andy Johnson, CEO, Diamond Cellar Holdings; Jason Goldberger, CEO, Blue Nile; Gina Drosos, CEO, Signet Jewelers; and Bruce Cleaver, CEO, De Beers Group. 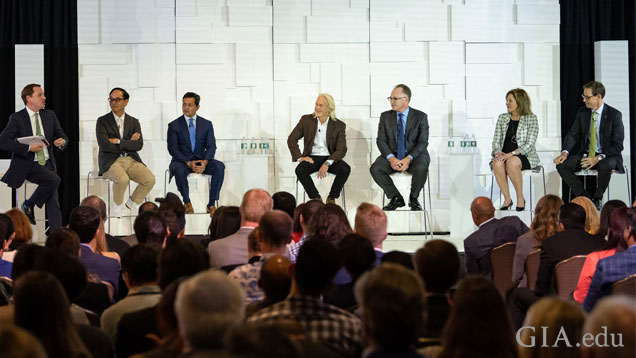 CARLSBAD, Calif. – Oct. 11, 2018 – The future of the gem and jewelry industry is bright, with new challenges creating great opportunities. That was the consensus from Futurescape Forum, the final session of the sixth GIA International Gemological Symposium, a landmark three-day event with nearly 800 participants from 36 countries representing every aspect of the global gem and jewelry trade. Opening the forum, Tom Moses, GIA executive vice president and chief laboratory and research officer, commented on the rapid pace of change in the industry while introducing a video from Professor Scott Galloway of New York University. Galloway, who was a speaker at GIA’s 2011 Symposium, offered three challenges the industry will face: continued consolidation in all sectors; the challenge of appealing to talent in a rapidly changing workforce; and disruption caused by laboratory grown diamonds. Six industry leaders – Bruce Cleaver, CEO of the De Beers Group; Gina Drosos, CEO of Signet Jewelers; Jason Goldberger, CEO of Blue Nile; Andy Johnson, CEO of Diamond Cellar Holdings; Rahul Kadakia, international head of jewelry at Christie’s; and Kent Wong, managing director of Chow Tai Fook – discussed these challenges and offered their predictions for what is over the horizon for the global gem and jewelry trade. The panelists agreed that there are increasing challenges in the retail landscape, but also opportunities, and that customer shopping is more and more integrated across all channels. Rahul Kadakia commented that while 90 percent of Christie’s auctions are live events, online auctions attract a new audience and offer a starting point for new collectors. Andy Johnson observed that with the majority of people buying jewelry in retail stores, retailers have a chance to develop a sustainable relationship with customers. The panelists agreed that diversity is a great benefit to any business and that a one-size-fits-all approach to hiring needs to be examined. Jason Goldberger offered that companies should avoid being insular and recognize that a mix of viewpoints is helpful. Kent Wong pointed out that many millennial workers – who bring great value – want to build their own businesses, and that firms should work cooperatively with them. Regarding laboratory grown diamonds, the panel recognized that they are attracting consumer interest, but that customers exhibit a preference for natural diamonds to mark important moments. Gina Drosos commented that consumers have an interest in natural diamonds for special life purchases, and that they are interested in being able to trace the unique story of their diamond. Bruce Cleaver emphasized the contribution of mined diamonds and their positive impact on ten million people in Africa. To close the forum, panel facilitator David Ager, managing director of executive development at the Harvard Business School, asked each panelist for their predictions for the gem and jewelry industry. The GIA Symposium has been held every five to seven years. At this most recent meeting, in Carlsbad, CA near GIA’s world headquarters, attendees learned about the latest scientific research from leading researchers and scientists, and had the opportunity to participate in a unique program in collaboration with the Harvard Business School to examine key business issues – authentic leadership, disruptive innovation and customer centricity. The Symposium proceedings will be published in the Fall 2018 issue of Gems & Gemology, GIA’s quarterly journal, which will be available at no cost on GIA.edu in November.